Very good interface, easy installation, very fast as primary os for older Pentium-based laptops. Try it, you won't regret, it has a great GUI, and a very friendly workspace manager. Better than Win95 as interface, but low compatibility (and harder to configure) than Windows95. Network configuration may give you some headaches, and installing it in VMWare results to some mouse interaction problems. I felt like installing it under VPC one day only to run into a problem... during installation, it's asking for what SCSI and floppy disk driver is to be loaded, and I don't think VPC has any of these nor do I know which one I could use. Got a bit frustrated for a while. Don't know if someone here can help. You can use an IDE driver instead of SCSI by pressing 7 repeatedly for more drivers. What has changed between DR2 and DR1? Looking good operating system but needs to color driver for color. And it has the kernel+userland of Darwin 0.1 (OS X Server 1.0) which can address far more ram than what the DR's were restricted to. However the PCMCIA drivers are missing from the source in the Darwin 0.1 CD-ROM so there is no PCMCIA drivers. For those who wonder about OS X on Intel, Rhapsody just shows that the i386 chain was in fact never broken. That once NeXTSTEP had been ported to the i386 back in version 3.1 that it was kept up the entire time. Although NeXTSTEP had also been ported to the SPARC & HPPA in addition to the i386, the cost/speed benefit of RISC just wasn't there. Intel had pulled the rabbit out of their hat with the Pentium Pro, and unexpectedly you could get RISC performance out of the x86 processor. Although there is evidence in the Darwin source of the abandoned 88k port, along with mentions of a PowerPC 601 port (98000 vs the 88000) the main emphasis of Rhapsody was porting to the newer PowerPC CPU's and of course the Macintosh hardware platform, along with keeping feature parity on the i386. And that is the 'secret' that port parity on i386 was incredibly important to NeXT and Apple. I think Apple was kind of forced to actually show their hand back then as the appropriate PowerPC hardware was scarce, and they were hoping to court NeXT developers who would have had the time be running OPENSTEP 4.2 on i386. Remember the Rhapsody strategy at this time was to force everyone to use Objective-C and the NeXTSTEP frameworks. Which Mac developers soundly refused to do, and a new MacOS with no actual Mac applications wasn't going to fly. 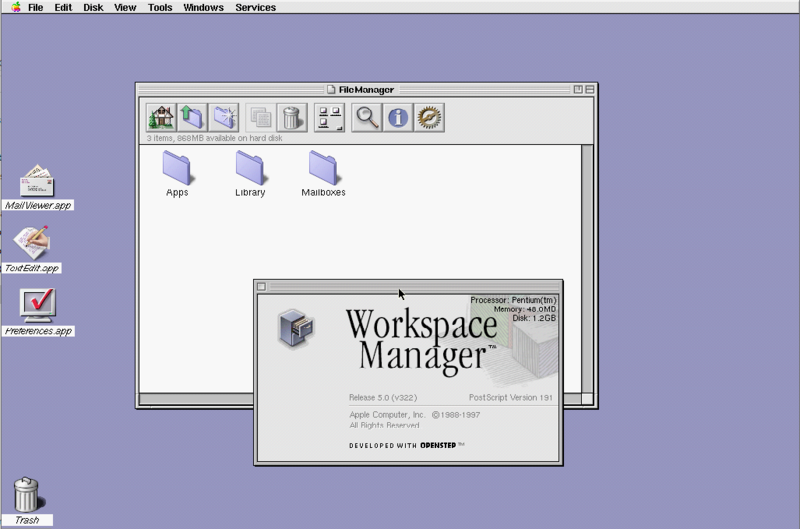 So it's no wonder that the workstation version of OS X 1.0 was shelved, and it was released as a server only release with it's killer feature being the netboot of iMacs (Steve has a demo somewhere of booting something like 50 of them off a single OS X Server). I've managed to get DR 2 x86 up and running on VMWare Player, using openstep-vmware drivers, producing 1024 x 768 resolution and full colour display. Unfortunately these drivers don't work for DR 1 x86. I've managed to install DR 1 x86 on Virtualbox, albeit without colour and a resolution of 640 x 480, (you don't get the erratic mouse behaviour with Virtualbox, like you do with VMWare). Does anyone know how to install the openstep-vmware drivers for DR 1 x86 in VMWare Player? After a lot of trial and error I've managed to get Rhapsody DR1 (Grail) x86 up and running in PCem, with full colour and 1024 x 768 display, no networking though. Wow, what config did you use? I'd like to try it out myself soon. Hard Disk: Sectors 63, Heads 16, Cylinders 2448, Size 1204mb. Firstly, for some reason it won't install using it's own supplied device drivers. After a lot of trial and error I finally tried using the Rhapsody DR2 Titan drivers and they worked! When prompted, you will need to load the EIDE and ATAPI Device Controller (v5.01) by typing 7 (enter), 7 (enter) and 3 (enter) you need to do this twice. Follow the instructions and it should start copying the installation files. When it's finished copying it will prompt you to remove the floppy and restart. On restart it will ask you to replace the device driver floppy before starting up. The boot screen will then seem to freeze at the point saying "Configuring Device Drivers", this will last for about 10-15 minutes, but it will eventually load. You will be greeted by a black and white configuration screen. Click on the monitor icon and select Diamond Stealth 3D 2000 (S 3 ViRGE), then choose your preferred screen size, click save. You will then be prompted to install. Sometime during these processes you will be greeted by a series of alerts complaining about missing drivers, just ignore them and click "continue installation". All being well these steps should do the trick! Does anyone know how to install Rhapsody for PowerPC on QEMU?